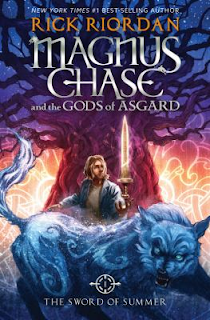 Magnus Chase, by Rick Riordan, presents a mythical adventure tale about a homeless orphan who dies. But, he is sent to a hotel-styled after life of the Norse mythology. Magnus soon discovers that he must journey on a quest to save the nine worlds from a very angry Wolf who is foretold to swallow the sun and start doomsday. Rick Riordan's new novel is a great beginning to a great trilogy to come. Every page is filled with the great mythology humor you would expect and gives a great look into Norse mythology with a twist on every character that makes you love every one of them. A great book for all. Truly I can't imagine a better book than this. I stayed up countless nights reading and laughing so hard that my eyes watered. This book is a real page turner full of jokes, fantasy, and adventure. 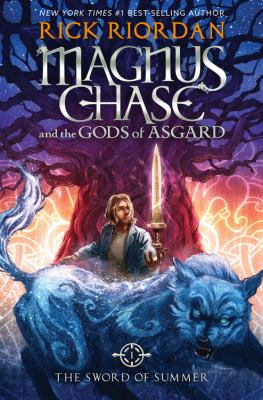 Magnus Chase and three friends travel the nine realms on a quest and are chased by giant man eating squirrels; fish for the giant world serpent; and play catch with giants, all with the antics of the Norse Gods, whom I will never see the same way again with Riordan's modern twist. Also, for all the Percy Jackson fans, you will see many similarities and hidden jokes. Now that you know this book exists, get up, find this book, and read it. This was a great book! Complete with talking heads, deaf a death and mute elf, a fashionable dwarf, a talking sword, and a vicious giant squirrel. I loved this book and highly recommend it to any book reader!